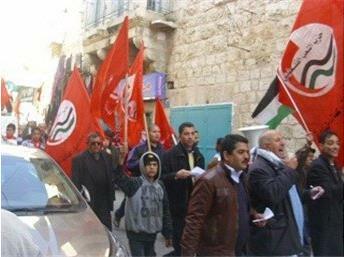 The Palestinian People’s Party and other left-wing groups held non-violent marches in cities throughout the West Bank Saturday, challenging the Palestinian Authority’s proposed austerity measures and privatization schemes.Several hundred people gathered in Bethlehem and in Hebron, Nablus and Salfit, challenging what they call the ‘capitalist elite’ of the Palestinian Authority in the West Bank (led by the Fateh party) – including President Mahmoud Abbas and Prime Minister Salam Fayyad. Specifically, the rallies focused on new taxes proposed in January by Salam Fayyad, the Prime Minister of the Fateh-led Palestinian Authority. Under Fayyad’s proposal, the general income tax rate for Palestinians would double from 15% to 30%. The reasoning behind this move is to reduce the PA’s deficit – brought about mainly by promised international assistance that was never delivered – from $1.1 billion to $750 million. But Palestinians in the West Bank, many of whom are living on extremely low wages to begin with, have challenged the across-the-board tax hikes, and instead encouraged the extremely wealthy, like Fayyad, to pay a higher share in taxes than the lowest-paid Palestinians. The Palestinian GDP per capita is 17 times less than the Israeli GDP – but since Israel controls all aspects of the Palestinian economy, including exports and imports, prices for goods in the West Bank are generally sold at Israeli prices – which are out of reach for the vast majority of Palestinians. At one of Saturday’s rallies, Khalid Mansour, a leader of the Palestinian People’s Party, called on the Palestinian Authority to lower taxes on basic goods, including fuel, electricity, water, food and medicine. After a ‘dialogue’ with other Palestinian political parties, Fayyad agreed to temporarily suspend the tax hikes until further investigation is conducted into the effects of the proposed hikes.